The Adorn Cosmetics Hydrating Cream Foundation Stick is made with a harmonising blend of organic Jojoba and Shea Butter, for women who adore a dewier complexion and also worship at the altar of long lasting, full, flawless coverage. This popular foundation helps to soften, soothe and hydrate the skin without clogging the pores, whilst antioxidants Vitamin A & E protect it and help fight free radicals. Suitable for most skin types with the exception of oily skin, and perfect for drier, more mature skin, or those who suffer with skin sensitivities. Natural earth minerals provide the pigments for the beautiful shades in the Adorn Cosmetics Hydrating Cream Foundation Stick range. Cleanse face and apply foundation primer, ensuring it has absorbed first. Draw a few lines on your cheeks, forehead, chin, and nose, then blend in with our Kabuki Foundation brush. The compact nature of our stick foundation and its consistency actually allows it to also double as a concealer, so if you need a little extra coverage in the under eye area or to hide blemishes, concentrate the stick a bit more on these areas. TIP: For best hygiene practice you may like to use a spatula to scrape a very small amount of foundation from the tube and apply with clean fingertips, before gently buffing in with a Kabuki Brush. Find your foundation shade by applying a small amount along your jaw line in the cooler months and your décolletage/chest in the warmer months; if it blends and there is no obvious lines, then it’s a perfect match. Alternatively trial a sample. For sun protection we recommend a light application of the Adorn Cosmetics Anti-Aging SPF 20+ Loose Mineral Foundation over the top. Store below 27 degrees and keep out of direct sunlight. 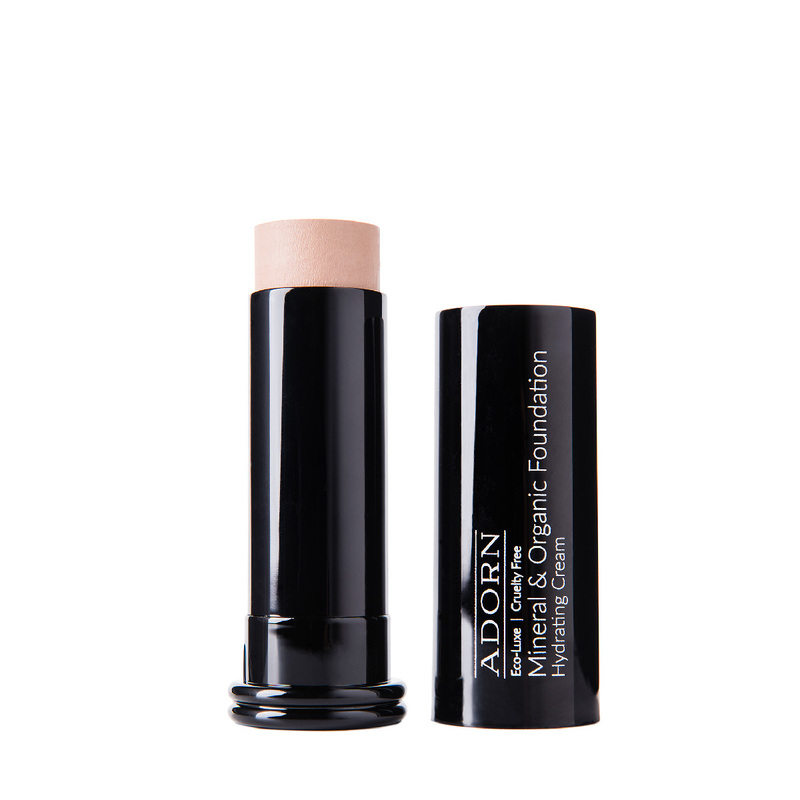 The Adorn Cosmetics Hydrating Cream Foundation Stick comes in a black wind up tube, with push on lid, and is made from PETG plastic.